Savvier companies develop their own innovation process to generate products with a "wow" factor. In your opinion, what is the most important skill to create real innovation? And how do you stimulate innovation within your company? In order to be recognized as a real innovator in the market place, you ought to pursue several approaches and make sure you provide open, cost-effective solutions that meet today’s real-life customer challenges and that work seamlessly in existing environments and with other products. While it is obviously important to have dedicated teams as well as strong leaders in place to drive product and process innovation in a structured, organized and sustainable way, it is also the customers as well as your employees which can and should be involved at any stage to foster the innovation process in your company. At Dell, many innovations begin in-house, led by a global team of top engineers, product designers and technical experts. 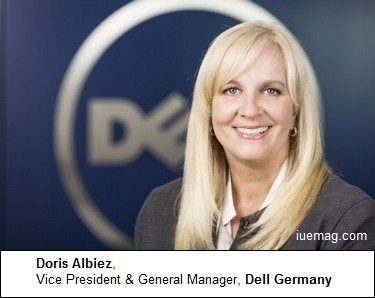 Others begin as a team effort with Dell’s strategic partners. To drive practical, real-world innovation, Dell has a dedicated Dell Research Team in place which delivers long-range, disruptive, pan-Dell research and development to inform and influence Dell’s technology strategy. Dell Research complements the company’s innovative research and development by collaborating across Dell’s technical community to create holistic, organic solutions focused on customer needs, with a two-, five- and 10-year outlook. By implementing a hybrid innovation strategy, Dell Research augments its organic research with an extended external community, including industry partners, thought leaders, university alliances and others, to leverage that wealth of knowledge for the benefit of our customers. With a team of industry and technical experts, Dell Research is focused on multiple R&D projects in key areas like Security, Internet of Things or Cloud, to name but a few. To make sure that innovations are of relevance and meet the actual needs of the customers out there, it is also absolutely crucial to always involve the customers in the innovation process along the way. This is why we gather requirements directly through tens of thousands of daily customer interactions, organized events, social media venues and customer panels. We actively invite our customers to bring forward their ideas and suggestions to simply give them a voice and provide a way to collaborate with Dell. Last but not least, in order to really benefit from the global teams’ creativity, knowledge and expertise, it is key to also provide each and every employee in your company with the opportunity to contribute to driving the innovation process, share and discuss ideas, vote or devote them in an open and stimulating environment. This is a form of the so called Open Innovation process just being applied to your internal workforce. All you have to do as a company is to find ways to stimulate creative processes among your employees, e.g. my means of incentivizing the process and awarding the most inspiring ideas and proposals. This is exactly why Dell honors the outstanding inventors among its employees on a regular basis by awarding them with the title “inventor of the year”. Any facts, figures or references stated here are made by the author & don't reflect the endorsement of iU at all times unless otherwise drafted by official staff at iU. This article was first published here on 28th December 2015.